Silicon Remembers Carbon : The shadow of the pedestrian was drawn into the video mix by the presence of someone walking along the left edge of the image. The central element in Silicon Remembers Carbon is a large video image projected down onto a bed of sand on the floor of the installation space. Visitors' movements subtly affect the mixing and dissolving of video images and sounds. Each visitor leaves traces which affect the experience of the work for later visitors. The installation presents a fragile illusion, a consensual hallucination, requiring the visitors' participation for its continuation, through their body movements, a willingness to blur their eyes slightly to hide the scan-lines, and their ability to project depth into the flat image. They are offered a range of possibilities from sustaining the illusion by creating and maintaining distance, to dispelling it by stepping into the illusionary space itself. For the artist, the visitors' movement through this range of possibilities represents a more important interaction than the direct interaction with the technical system itself. A 4 meter x 3 meters video image is projected from above onto a bed of sand. There are 1/2 meter walkways forming a frame around the image. The interior of the enclosing space is completely black. A speaker hangs in each of the four corners above head height. Four infrared cameras look into the sand from 4 sides, looking over the shoulders of any viewers, capturing their silhouette. A collection of videos reside on the computer, and are mixed interactively based on movements in the space. 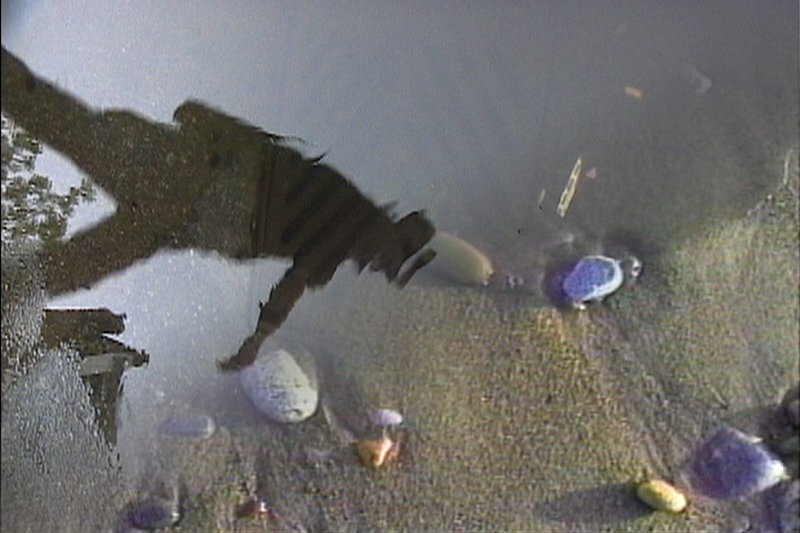 When one enters the empty installation, a single video clip is playing out across the sand. Most likely the image is of water (beach waves, water under a bridge in Toronto, passers-by reflected in the canals of Hamburg, shadows and reflections in street puddles...) The image creates the illusion of depth, the sand sinks underneath it. It is not clear that the 'screen' is sand. People look around then reach surreptitiously down through the depth of the image to the dry sand. If someone is sensed walking along one side of the image, a second stream of video is either dissolved in along that edge or cut into the existing image using that person's silhouette as a mask. The new video stream usually contains shadows or reflections of people along the edge of the clip that is visible. One tends to interpret those reflections and shadows as the being generated by people actually in the room, either oneselves or others, rather than as being present in the image itself. So this installation is some sort of fake reflecting pool, an inversion of Narcissus's experience. Whereas Narcissus's tragedy is that he cannot recognize himself in his reflection, the visitors to the space would find themselves identifying with shadows and distorted reflections that had only circumstantial relation to them. - the actual shadow you cast by blocking part of the projection if you step onto the sand. - your silhouette mediated by the system, cutting a second stream of video in. These multiplicity of shadows of different types and different relationships to you complicates the process of locating your interactive agency in the work. The result is an ambiguous play of shadow relationships, where identification appears and disappears... In my experience, once we have determined a work to be interactive, we collaborate to sustain the illusion, even to the degree of making small involuntary movements to adjust our position to an apparent shadow or projection of our body that shifts slightly out of proper alignment. 'Live Virtual Shadow' in Version 2, Lowry Centre. "World Wide Video Festival", Den Haag, Netherlands. "Feuer/Erde/Wasser/Luft", the "Mediale", Deichtorhallen, Hamburg, Germany. "Press Enter", the Power Plant Art Gallery, Toronto, Canada. permanent installation in "ArtWorks", the Lowry Centre, Salford Quays (Manchester), UK.